Synods of 1689 and 1716. Town of Moravia, Austria; it has a population of about 10,000 (1900), of whom over 1,000 are Jews. The Jewish community there is one of the oldest in the province. As appears from the records of the old ḥebra ḳaddisha of Göding, two Jewish cemeteries, an old and a new one, existed there as early as 1682, at the time when the statutes of the ḥebra ḳaddisha were drafted. In the month of Nisan, 1693, these statutes were revised as published by I. Willheimer in the Vienna "Neuzeit" of 1864. The community seems to have suffered greatly during the Thirty Years' war, and was so reduced that for years it could not keep a rabbi of its own. It called upon outside rabbis to decide religious disputes appealing especially to the Moravian district rabbi, Menahem Mendel Krochmal, who several times decided questions for it ("Ẓemaḥ Ẓedeḳ," No. 33). At that time (between 1648 and 1661) large vineyards and cellars in the villages in the vicinity of Göding were owned by wealthy Jews. In 1670 the community was considerably increased by Jewish exiles from Vienna and Lower Austria. Refugees settled in large numbers in the neighboring crown lands. Among them was David b. Isserl, who had placed himself under the protection of Prince Dietrichstein of Nikolsburg as "rabbi of Göding" (Sept. 1, 1672), paying the yearly sum of three florins for protection; he officiated there until 1676. Moses b. Isaiah, author of "Berit Maṭṭeh Mosheh," a large commentary to the Pesaḥ Haggadah (Berlin, 1701), and for a time house rabbi of the "Hofjude" Jost Liebmann at Berlin, passed a part of his childhood at Göding, after his parents had been expelled from Vienna. In 1689 and 1716 synods were held at Göding, at which important resolutions were adopted relating to the communal life of the Moravian Jews. In the middle of the eighteenth century the community seems still to have been an important one, for in 1753 it numbered 140 families. In June, 1774, all the Jews were expelled from Göding by command of the empress Maria Theresa; but after her death Emperor Joseph II. recalled thirteen families to complete the number of 5,400 families allotted to Moravia. The neighboring estate of Kosteletz had received twenty of the families expelled from the town. The above-mentioned thirteen families formed the nucleus of the new community of Göding, which had increased to fifty families by 1864. This new community at first had no rabbi of its own, but called at need upon the rabbi of the neighboring Hungarian community of Holics. In agreement with the law of 1890 relating to the organization of the congregations of Austria, an independent congregation was organized at Göding. 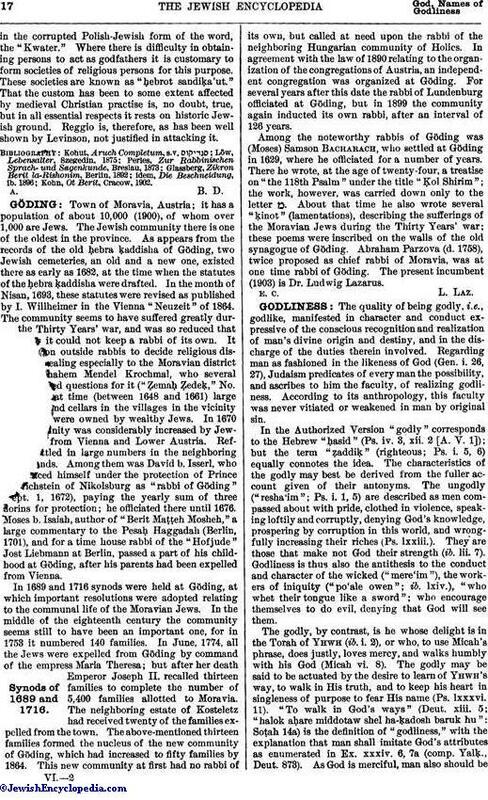 For several years after this date the rabbi of Lundenburg officiated at Göding, but in 1899 the community again inducted its own rabbi, after an interval of 126 years. Among the noteworthy rabbis of Göding was (Moses) Samson Bacharach, who settled at Göding in 1629, where he officiated for a number of years. There he wrote, at the age of twenty-four, a treatise on "the 118th Psalm" under the title "Ḳol Shirim"; the work, however, was carried down only to the letter מ. About that time he also wrote several "ḳinot" (lamentations), describing the sufferings of the Moravian Jews during the Thirty Years' war; these poems were inscribed on the walls of the old synagogue of Göding. Abraham Parzova (d. 1758), twice proposed as chief rabbi of Moravia, was at one time rabbi of Göding. The present incumbent (1903) is Dr. Ludwig Lazarus.